Do you have the cold or flu and the discomfort of a stuffy, runny nose? If so, you’re just going to have to ride out the symptoms, as there is no cure for the cold or the flu (though it’s wise to get the flu vaccine every year). However, by blowing your nose properly, you won’t make your cold or flu situation more severe. It sounds funny, but proper nose-blowing technique is important to shorten the duration of your cold and will stop it getting worse (or turning into other infections). You want to make sure that you don’t inadvertently make your mucus and infection any worse than it already is, so make sure that you blow your nose gently. Many flu victims blow their nose too hard, causing pain to their ears. Your nose and ears are linked inside your head, and blowing your nose too hard can force mucus into your ears via your sinuses, creating a secondary infection. So it’s important to blow your nose with light force only. You do want to be sure to expel as much nastiness as you can when you have the flu or a bad cold, so do make sure that you blow your nose often. Keep a large supply of Kleenex near you at all times. You can buy special tissues with moisturizer in them to reduce the rawness and discomfort caused by repeated nose-blowing. If you can’t afford the extra expense, make sure to rubs some moisturizer, mineral oil or Vaseline onto your nose after each blowing, to keep the skin as hydrated as possible. 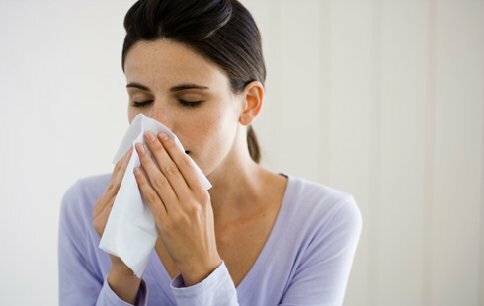 Saline nose wipes can help prevent chapped noses during bouts of the flu. Some wipes and treatments are menthol scented, which help open the nasal passages and reduce congestion. Kids with the flu especially prefer moist wipes over dry tissues. Apply a light antiseptic cream to already-raw noses and rub in gently to prevent further infection and to help your nose heal. Another tip – don’t blow out of both nostrils at the same time. Doctors recommend that cold and flu patients simply place one finger against one nostril to block it shut, while simultaneously blowing through the other nostril into a tissue. Again, don’t do this too hard or you’ll pay for it later!